Power fold wasn't an option on the tow mirrors of that vintage. Parts replaced under warranty are covered for 12 months unlimited miles, or the remainder of whatever warranty covered them initially whichever is longer. If you pay for as repair most are 24 months, unlimited miles. Some are 24/24, some are 12/unlimited, and some are 12/12. Same goes for parts purchased over the counter but the labor isn't covered. Buy a running '96 and swap literally everything? THIS. Also if your point of contact is anyone other than the body shop that's an issue. You also don't know what the dealers work load was before the body shop dumped your truck off to them. It sounds like they're pawning it off. Something else is wrong the body shop should be able to do the calibration. Not trying to sound like I'm defending anyone but this is a pretty regular occurrence, especially with windshields, it's easier to blame the big bad dealership. The cause of the condition may be the internal spool sleeve in the starter not allowing full travel of the armature to engage the flywheel. How can they guarantee anything is going to fix anything when, from what it sounds like, the trucks not at the shop and hasn't been torn down? Best bet is to pay the hour or two to take off the valve covers and inspect whats going on. Anything more than a decarb, valve cover, and deflector do the engine. The warranty is better and less chance for human error. Also 5.7hrs is warranty time for the G8 book time is going to be more. Will off-road steps 23194635 fit a 2018? New number is 84164549. They should work, if you want to send me your vin I can double check. Definitely a Canadian truck. They could have swapped the cluster. When they put the ad up they probably just used base info, not really that big of a big deal. You have pictures of the lights? I don't know of any after market kit that includes axle shafts. 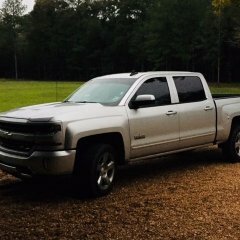 My B. GM doesn't offer a lift for the older body style.